A big Mac box by a door is never a good sign. Yesterday, my workhorse of a machine decided to call it a day and so off I went to the Rosedale Mall Apple Store to see, in essence, what up. Turns out a new hard drive is needed. At least I know I wasn’t imagining the Spinning Rainbow Ball of Death. I will tell you this: I am praying to all the Data Gods of the Entire Universe that my Time Capsule back up holds a complete record of my content. That, and I pay for offsite back up as well, but if I’m being honest, I have no idea what I’m actually paying for. I feel like it’s just my email and maybe my photos. In fact, I don’t even want to think about my photos. I am not going to think about my photos. I am trying to adult right now. And to top it off, my website has been having some issues with my comments, as well. I am looking into that but if I’m being honest, again, I have no clue how to troubleshoot this site. So I’m going to pay for that. I love being self employed. Which is true. It’s just that some days, there are some hiccups. Some days adulting is not as much fun as others. 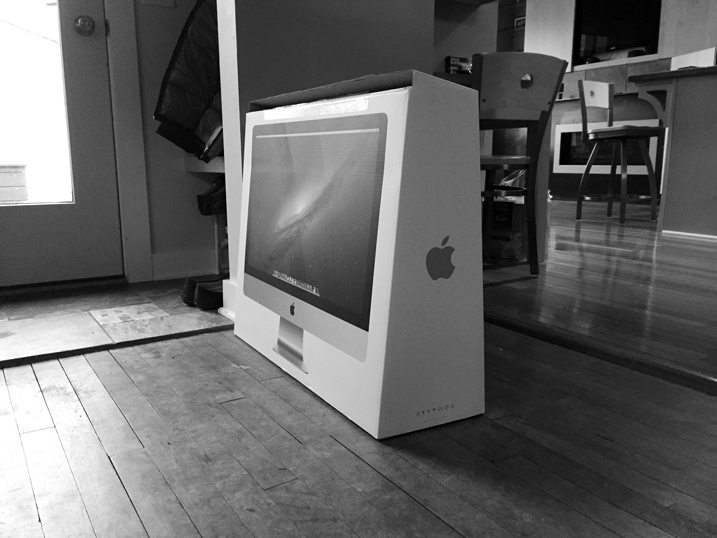 I’m not sure what model/year your iMac is/was but oh that big box looks so familiar. My husbands company bought a whole slew of those pretty iMacs and now every.single.one. of them has had the need to visit the apple store for hard drive issues. Apple definitely got something wrong with these iMacs. And I get that some people have them and have never had an issue (lucky them!). I’m sorry you are having issues with yours. There’s nothing worse than a misbehaving computer when your business is run primarily on that computer. I do my own maintenance where I work (I am the only mac user) and when mine has trouble, it’s nothing short of a bad, bad day. I hope the Apple people are able to recover your drive (and hopefully the backup service you’re paying for has all of your stuff backed up. If they don’t, you should consider looking into exactly what they are backing up. I don’t use a back up service but instead I have an external drive hooked up here at work and a second one at my house that I also back up things to. And I burn DVD’s. I’ve learned the backup lesson the hard way and now I am a “back things” nut. Here’s sending some positive vibes your way and crossing some fingers for you that everything turns out ok! Thanks, Maureen. I am hoping that my Time Capsule back up does the trick. I am so glad I bought a lap top last year because i can continue to work in a limited capacity while my machine is getting fixed. this type of thing makes me fall to my knees and promise EVERYTHING.LIVING.THING. that I will set up a back up system. ‘whah? someone say something about backin’ up stuff”. I’m seriously going to make absolute certain our Time Machine is working, and I’m even thinking I’m gonna cough up cash for a cloud service. Sending every single technology fairy wish your way. And sweating bullets over here in Chi-town waiting to hear that all has been resurrected. I’m the same! Every time I see someone’s machine fail I think “oh, I better back up my laptop!” and usually I get it done. But I have no idea what I would lose if the darn thing did die suddenly. I’m putting “back up” on my to do list right now… Ooh, kitten! Thinking good thoughts for you and your machine. Technology is awesome when it works. If it makes u feel any bit better, I dropped my EHD a few months ago. Click click nothing. Bought a new one and was able to restore everything from my Time Machine backup. Sometimes bring an adult is THE WORST. ??? So sorry to hear about your Mac troubles. I’ve worked on Macs for over 25 years — from the Macintosh SE/30 (tiny screens!) to the 3-year-old iMac I use today. Good God, there was even a Mac Quadra in the mix. So, yes, some models are better behaving than others. If you wouldn’t mind, please let us know if Time Capsule works. I’ve been using it, but never put it to the test (knock on wood). Will do! I too have had my share of macs… an SI, a Quadra, a G3, a G4, and now, my latest, a super souped up iMac. I have faith it will restore, but I need to just stay in the moment. our iMac is so old. I don’t even know how old. It’s been having some issues too, so my husband reformatted the hard drive and completely restored it from the time capsule backups. It worked perfectly and everything was just as before, so have hope! Oh….I am so sorry. Hoping that they have some true geniuses to restore everything! A day of trepidation when things like this happen. Crossing fingers and toes! Our time machine was our lifesaver when our computer failed! I am sure yours will be as well. 🙂 My husband always says “it is not a question of IF but rather a question of WHEN will the computer fail”. I cringe every time he says it, but it is so true! Gosh tough deal! But on the bright side, now you have shiny and new! And a Mac!!! Love those things! Let us know how the time capsule and online backup restores go, cuz I also have same deals going on. Not sure what would happen if I needed them really! Pulled up a random file from Time Machine, yes it is there and looks good. Thanks for the reminder. Time machine is a wonderful invention. I have restored from it 3 different times, and each worked flawlessly. Wishing you really good luck. Cathy, I really feel for you! I’ve never (ooh—did I say “never”???) had a computer failure. I’ve had Macs since the very beginning, when I beta-tested that tiny little one and have had umpteen in between. I get new ones because my software gets outdated, but they’ve all worked flawlessly. Except when storms fried my mother board—twice. But that wasn’t Mac’s fault. I have external BU drives, and I put various groups of files on jump drives too. I don’t use the cloud because I don’t trust it either. Still, I’ve never set up Time Machine—maybe I should do that ASAP. I am keeping my fingers crossed for you that all your data is saved. I would be sick to my stomach! OK, off now to do some back-ups…. I think in 25 plus years of being a Mac user, I’ve had three system failures. All of them were covered by Apple Care. And I always had back ups on externals. Yes, i cannot stress enough the importance of a back up system. Aw man. Computer blips are the worst. And thanks for the reminder to go back up my machine… Fingers crossed everything works out just fine. Darn and drat! I hope your IT department gets everything back up and running for you soon! I can hardly read the comments – they’re making me really anxious about my poor little laptop and now I’m thinking it’s about to die and I have no idea what I might lose…. eeek! I know it is meltdown time…..I feel your pain….I went through this went my brother who was sure he lost everything and Apple came through with a miracle! I’m keeping my fingers and toes crossed that they do the same for you. I’ve had to replace my hard drive in my old iMac 3 times. I’ve always restored it with a time machine backup without issue. An even my time capsule is as old as my iMac. I hope you have the same luck! This makes me want to chew my fingernails right off!! Cathy -contact Becky Higgins’ brother Kevin Allgaier. He is a genius at this stuff!! I had a full-on catastrophic and irreversible iMac crash in 2011 or 2012 and Time Capsule saved it ALL, not a single problem transferring to the new machine. The new machine (er, the replacement for the crashed machine so not really new in 2016) had to have its graphic card replaced in January, but Apple paid for the entire repair because apparently there was an issue. So make sure you scour the support forums to see if whatever is going on with yours is covered, even if it’s not under warranty anymore! I don’t have a lot of advice about this other than hang in there. Regarding the photos, my external hard drive went KAPUT and I lost EVERYTHING. It was a hard lesson in “life is short”, “what REALLY matters?” and “nothing material is forever”. It has helped me live a lot simpler. Best of everything to you, friend. Elle, good words of wisdom. 🙂 I just returned from the Apple store with my newly fixed machine. The Time Machine back up has just started and maybe by morning, the machine will be as good as new! I have recovered from my Time Capsule backups three times over the years. It worked beautifully every time! I’m sure yours will too! Sounds like you are doing all the right things to save your files and photos. I need a better back up plan. I do time machine but only once a month. My MacBook pro is 8 years old. Had a hard drive replacement already. I think it’s time to replace it. Works but it runs slow. I can’t use the new software. Thinking about the imac. Can’t wait to hear your good results from this.